Hi everyone, this is one of those posts that I was not looking forward to writing, but felt it is the right thing to do. My mother went into the hospital this weekend. I have written about our adventures in aging and Parkinsons Disease, and now we have taken that next step on the adventure. Two weeks ago she had the flu, and was recovering well, but the flu turned into pneumonia, which turned into congestive heart failure. It has been a long time since I have had to deal with hospitals, and all that goes on there. I am impressed with this one, Kuakini. The nurses seem to walk the tightrope of focused efficiency, and concern for the patient’s well being. One nurse impressed me, he is in charge of IV’s. That is all he does, he has been trained to know all the various types of IV’s that can be used these days. He came to mom’s room, was very polite, and incredibly gentle with her. 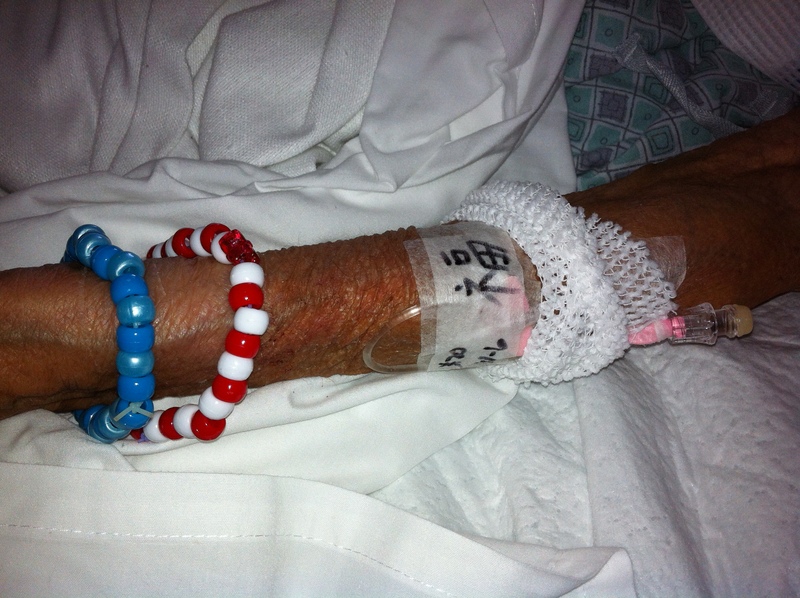 He changed her IV, and he used a sharpie to write the date, and after that he wrote a set of symbols I didn’t recognize. I asked him what it was and he said, “it is the Japanese symbol for Good Luck.” That is the sort of thing that makes this stuff tolerable. And don’t you like her bling? As things go, the doctor seems to think that she is still well enough to return to the residential care home in a few days. As to the next phase of the adventure, things have taken a turn and we’ll have to see what is around the next corner. I will do my best to keep up with my regular schedule. But don’t be surprised if I miss a day or two. I find it difficult to concentrate on much else. Thank you all for stopping by, and for joining me on this adventure. Bless her. I’m thinking of her and you. You know we love you and are her for you if you need us. My grandmother has Alzheimer’s and she was in and out of the hospital (near death) all last year. It was very draining on all of us and I’m sure it was just awful for her as well. Sending prayers and love your way. I remember my last birthday dinner party on Oahu with you, Ron and your Mom. She was so sweet. And, I will always remember her at that moment. Thank you for introducing me to her. Thanks you guys. Knowing you are all out there thinking of us is so helpful. Oh, my prayers are with you and your family. It is so tough to care for an aging parent. I am glad that she has been given gentle and compassionate care while in the hospital. It’s not always that way. Prayers and good wishes to you and your mom. I’m sorry both of you have to go through this. May you find the strength and grace you need when you need it, and sleep and peace when you need that. BTW, I love the bling and the Japanese symbols. Take care of yourself, Rachel.